Conceived in the mid-‘80s as a traditional body-on-frame SUV, Nissan’s once tough-guy Pathfinder has mellowed into a competent and almost sedan-like midsize crossover. For 2015, this fourth-generation 7-passenger mini-ute returns in 4 trims, the base S, the up-featured SV, the posh SL and the top-shelf Platinum. Also returning are some hefty cabin room and a third-row seat that will fairly comfortably accommodate a pair of average-size adults. Cargo capacity, meanwhile, remains a decent if not overwhelming 79.8 cubic feet with the rear seatbacks folded. Of course, the 2015 Pathfinder lineup is delivered with standard front-wheel drive (FWD), but again, a selectable all-wheel drive (AWD) system is available to the entire Pathfinder stable. Said configuration allows cruising in the selected FWD mode in normal conditions, with a 4WD (4-wheel-drive) setting that allows some light off-roading and an Auto setting whereby torque can be transferred automatically from the wheels that slip to the wheels that grip. A few changes also come with the 2015 Pathfinder stable. Among the most noteworthy of these is the re-programmed standard continuously variable transmission (CVT), which Nissan calls “D-Step” logic. This tweak allows a more conventional shift sequence than before, thereby eliminating much of the over-revving that previously dogged the shifter. Further upgrades for 2015 include standard blind-spot warnings with rear cross-traffic alerts in the SL and Platinum trims, along with a 360-degree camera that’s now available to the Platinum trim. Meantime, each AWD trim now comes equipped with newly standard hill-descent control. Carrying over from 2014 is the standard (and only) 260-hp 3.6-liter V6 engine that mates with the newly improved CVT to put out 260 hp and 240 lb-ft of torque. Look for 5,000 pounds of towing oomph from the 6-cylinder when the available trailer-towing package is installed, while EPA-estimated mileage numbers, despite the upgraded CVT, return at 20 mpg city/27 highway in FWD versions and 19/26 in AWD trims. The 2015 Pathfinder stable once again manages to pack some hefty bling into even the lower trims, with the base Pathfinder S toting such niceties as 18-inch alloy wheels, tri-zone climate control, keyless entry and ignition, cloth upholstery and full power accessories. Additionally, cruise control and telescoping tilt-wheel steering also come standard in this entry-level trim, with entertainment provided by a 6-CD changer boasting 6 speakers. 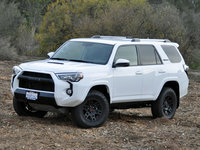 The next-up SV adds a roof rack, heated outside mirrors, a power-adjustable driver’s seat and an auto-dimming rear-view mirror to the mix, along with a rear-view camera, rear parking sensors, satellite radio, Bluetooth hands-free calling and a 7-inch infotainment touchscreen. Stepping into the SL gets you all of the above, plus standard remote engine start, a power liftgate, heated power-adjustable front seats, heated rear seats and memory for driver settings. The top-shelf Platinum, meanwhile, boasts 20-inch alloy wheels, a heated and power-adjustable steering wheel, ventilated front seats, the new-for-2015 360-degree around-view camera system and an upgraded 8-inch infotainment screen. 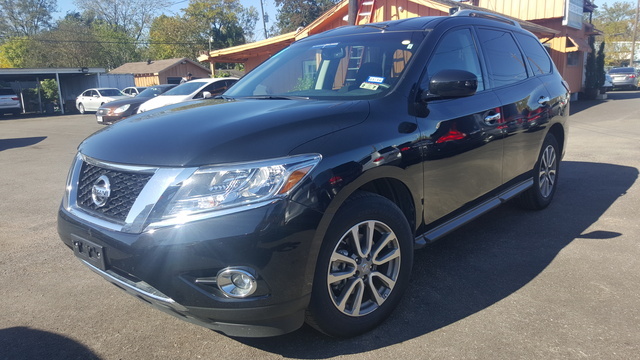 A power-opening panoramic sunroof, hard-drive-based navigation and rear-seat DVD entertainment are all optional for higher Pathfinder trims, as is a 13-speaker premium audio system. Finally, standard safety equipment aboard all 2015 Pathfinder iterations includes 4-wheel antilock brakes (ABS), front side-mounted airbags, 3-row head airbags and a remote antitheft alarm. The SV and higher trims add standard front fog/driving lights, with both the SL and Platinum trims now carrying the newly introduced blind-spot warning technology with rear cross-traffic alerts. What's your take on the 2015 Nissan Pathfinder? 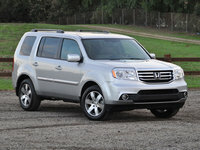 Users ranked 2015 Nissan Pathfinder against other cars which they drove/owned. Each ranking was based on 9 categories. Here is the summary of top rankings. 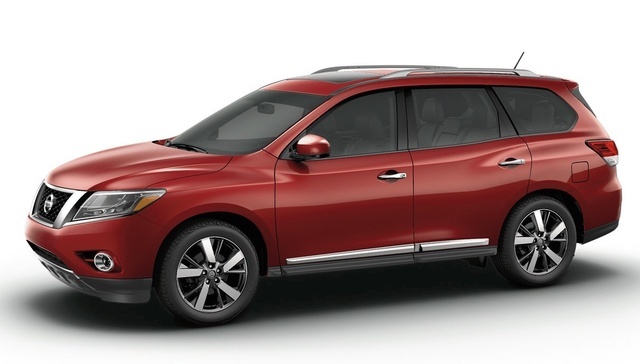 Have you driven a 2015 Nissan Pathfinder? Bought certified pre-owned 3 months ago. Today, suddenly the AC blows ambient to warm air. The only time it blows cool or cold air is if I turn the temp to 60, the lowest setting. Looking for a good all season tire. I drive 90 miles a day and am replacing tires every year.